"God's Gift of Abundant Blessings From Above"
Shiloh truly is a gift from God. 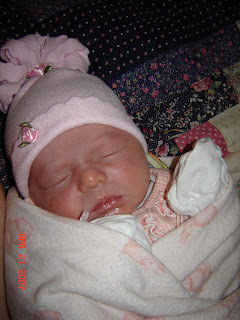 Her middle name, Rayne (pronounced "rain"), is in honor of her Great-Grandma Mabel who passed away last year. Gram always prayed God's blessing on you before she said goodbye. Before she passed away I was able to tell her that we were expecting a new baby. She talked about it regularly, according to my aunts, and just before she died she told my Aunt Becky that since she couldn't stay around to meet this new one, she might as well go home. To her, "home" was in heaven with Jesus. And I know that she is smiling down on this little life that carries a name in her honor. I have to smile right now... I'm sitting here typing, and I can here the three oldest in the other room sitting quietly and reading stories. Alex and Chase are taking turns. These are the moments that make all the chaos worthwhile! Well, off I go to wait some more :) Happy Easter to all! Well, I actually still have quite a bit to get done, but here's a start! 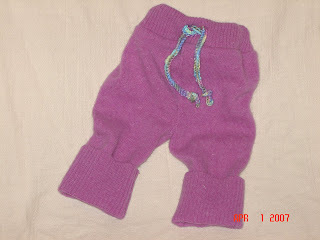 I finished 1/2 dozen diapers and one wool soaker. 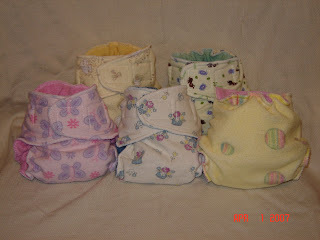 I'm also planning on heading to Steph T's to make a couple more diapers and some PUL covers today. So, we're getting there! The baby is expected in the next 2-1/2 weeks ;) Can't wait! !